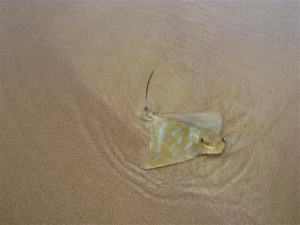 as the name implies, right at the beach but is separated from the sand, and sheltered from the wind, by some natural bushland. We arrived just after 4:00 on a Wednesday afternoon and soon had the camp set up. It is so much easier with the caravan than with our trusty old tent! This is a dog friendly park and, of course, we didn’t forget our little BJ. He chose a spot just beside the concrete slab and was more than happy to lie there in the sun while we set about getting organised. And then it was off to have a look at the beach. The sign said that dogs are not allowed on the beach so we couldn’t walk on the sand but we were to learn later that dogs are permitted on the beach north of the surf club. However the sun was going down and so was the temperature. A light wind was blowing and that made it seem colder so we returned to the warmth of our camp. John mentioned that he wouldn’t mind sitting on the breakwater with a fishing rod for a while but with my fingers, toes, and lips slowly turning blue with the cold I told him what I thought of that idea! And when a gust of freezing wind blew his cap off he had to agree! from the river entrance for several kilometres, linking up with the town of Laurieton. We walked out to the end of the breakwater to where the river flows into the Pacific Ocean and the water there was so blue it was almost a turquoise colour. The beach looked fantastic and there were a few hardy souls surfing. A tad too cool for that, I would have thought but they’re obviously die-hard surfers! A lot of fellows were fishing from the breakwater; they tell us that the fishing is usually pretty good there but no one seemed to be catching anything! Still, that didn’t seem to matter. It was a glorious morning and the air was fresh and clean and smelled of saltwater. In the summer this place must be as close to perfect as you can get. A quick visit to the information centre in Laurieton and we were off to Dunbogan, to the other breakwater, and Pilot Beach where BJ could run leash-free. We walked on the beach for a while and let BJ run. In the distance we could see Point Perpendicular; it didn’t seem that far and a walk on the beach sounded good. Unfortunately, we reached the end of the sand long before we reached the Point. The tide was coming in and if we’d climbed over the rocks we could well have found ourselves stranded until the tide went back out. But it had been a good walk and BJ had stopped frequently to roll around in the sand. It was going to be such a joy to have to brush out his coat! Later that afternoon we set off for a drive up North Brother Mountain to the Laurieton Lookout and the view from there was totally unbelievable! The lookout is in the Dooragan National Park, which is administered by the National Parks and Wildlife Service and includes seating on the 3 viewing platforms as well as several picnic tables and chairs, and everything is wheelchair friendly. There is even a take-off site for hang gliders! But the view is what commands attention. 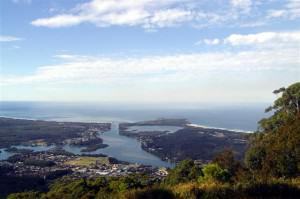 On a clear day you can see south as far as Forster and Seal Rocks, west to Mt. Gibralter, and north to Smoky Cape. In fact you can just about see forever! It was very cold with an icy wind blowing at the lookout so we didn’t stay as long as I would have liked; there are several walking paths throughout the lookout and in the national park but John could hear a fish calling so it was back to camp for the fishing gear. I decided to spend some time getting the sand out of BJ’s coat so John wandered out onto the breakwater alone. I thought that we might join him a little later on but I seriously doubted that he would be out there too long; it had become really cold and the wind had picked up quite a bit. this sounded interesting. It was not quite a kilometre in from the road along a rough and sandy track when we came to another sign. This one said “Perch Hole. No dogs allowed.” Well, that meant that BJ would have to stay in the car while we had a look around but what a neat place! Part of the lake system with a small sandy beach and a boat ramp. A car, with a boat trailer attached, was parked nearby and obviously the owner was out on the lake, catching fish, one would assume. 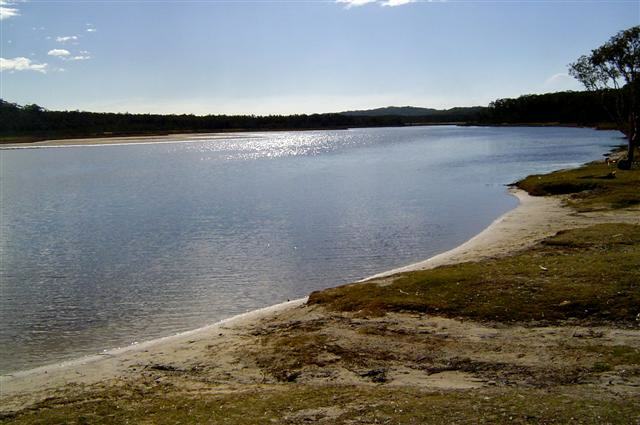 The area had picnic tables and the water was shallow enough here for small children to play. We stopped a little further on to let BJ have a run and then it was on to Bonny Hills and Lake Cathie. 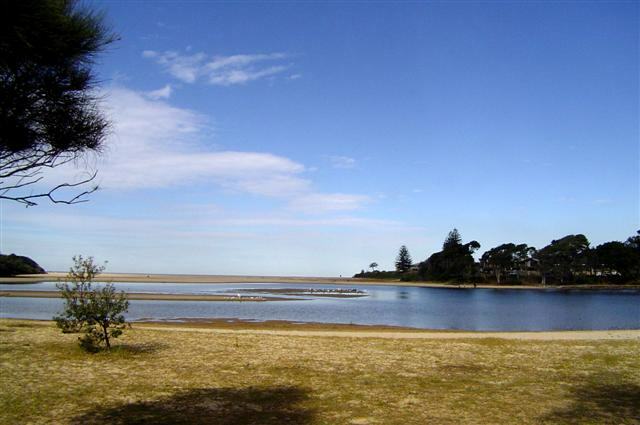 At Lake Cathie there is a sandbar that separates the lake from the ocean and periodically the bar is dredged but that wasn’t happening today. This park beside the lake is dog friendly so this is where we stopped for our picnic lunch. BJ likes to run and explore but he doesn’t wander far, especially when there is food around! A few clouds started to roll in after lunch and the weather didn’t look too promising from that point on. We drove down to Spooney’s Bay at Bonny Hills where there is 4×4 access to the beach but there were several large black rocks at the end of the track; not a good idea to drive over them so we settled for a walk on the sand. Some tracks in the sand made it obvious that some drivers had braved the rocks but John said no, he wasn’t going to risk any damage to the car. The clouds were heavier now and a few drops of rain had started to splash onto the windscreen by the time we drove to Grants Beach, which is commonly known as North Haven Beach. There is a walkway from the parking lot but we decided against it. It looked like rain was coming and it was getting windy; it is winter, after all. It was a little after 3:00 and John decided to brave the breakwater again and go fishing. This time I definitely was not going! It had stopped raining and the wind had dropped but it was still very cold and overcast. John managed to stick it out for about an hour and a half before he realised that even the fish were tucked up in some warm place and definitely not interested in his bait so he packed it in and returned to camp chilled to the bone and soaked through from the ocean spray. The wind became very strong and cold at about 2:00 the next morning and it heralded the start of a cold and wintry day. At least the sun was shining when we set off for Long Point and the Long Point Vineyard. The Long Point Vineyard is more than a winery, as the publicity goes. 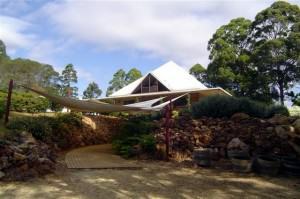 The car park is fully landscaped and you walk under the sails to enter the underground cellar. Graeme and Helen Davies are the owners of the vineyard and Graeme is the winemaker. We met Helen at the Cellar Door and while we tasted a few of the wines she told us a little about the area, the winery and vineyard, and the winemaking process. There are a number of local goodies to buy there and often there is local artwork on display as well. We learned that one of the most popular of the wines produced here is the dangerously delicious liqueur known as “Agent Orange”. It sounded like something no sane person would taste if they were driving and so we opted out of trying that. 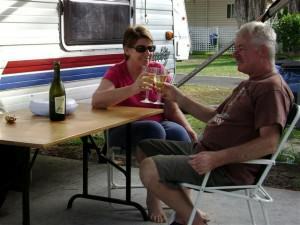 The vineyard offers a parklike setting with picnic tables and barbecue facilities at no extra cost. We purchased a couple of bottles of the excellent reds they have here and left with a promise to return some day. 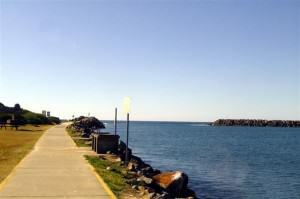 This was our last day in North Haven and I wanted another walk out along the breakwater. The wind was howling and it was icy as we stepped out onto the rocks so we didn’t stay long there. We also drove around to Pilot Beach to let BJ have another run. There were a few surfers out when we arrived and it was obvious that they weren’t feeling the cold but you couldn’t have enticed me into that water for all the money in the world! We let BJ run as much as he wanted and we walked to the other end of the beach and back. By the time we were ready to leave we were the only ones left. The surfers had all gone so I guess they were feeling the cold after all. Not surprising given how cold and windy it was. The rain finally arrived this evening in the form of a storm. It just bucketed down and the wind was almost strong enough to knock you off your feet! Well, maybe not THAT strong but I was glad our little caravan was in a sheltered spot. And then the power went out and stayed out for about half an hour. We learned later that the whole of North Haven was without power. The weather cleared pretty quickly after the storm and the wind was nearly as strong as it had been. 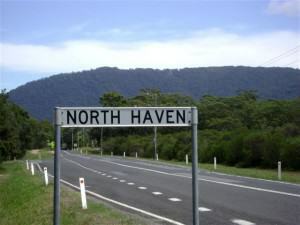 North Haven is but one of many little villages that are a part of the Camden Haven area and is on the mid-north coast of New South Wales, about halfway between Taree and Port Macquarie. Even though the weather had its moments during our stay, it didn’t stop us from wanting to come back at some time. And that is precisely what we did albeit five years later and this time in the summer. 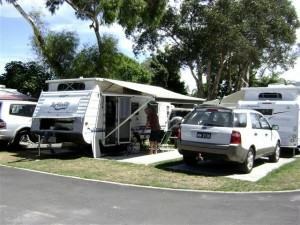 On our second visit we checked into the Jacaranda Caravan Park ([star][star][star][star]), another dog-friendly park and quite close to the beach. It was a perfect summer afternoon with the sun shining and the temperature way up and it didn’t take us long to get set up and head off to the beach. As usual, John wanted to check out the fishing on the breakwater and I wanted to let BJ go for a run. A slight breeze was blowing and it was quite pleasant sitting on the sand. It was when some folks with big dogs arrived that we thought it best to return to camp. BJ wanted to play with them and whereas he’s not aggressive or confrontational in any way, they were an unknown quantity. And, in any case, a bottle of Two Tails Sparkling Wine was chilling nicely and waiting for us. In the early evening, with the sun setting and the breeze plying lightly we toasted our first night in a new tourist park. The next morning we returned to the beach for a walk along the sand while John looked for good places to fish. It’s beyond me how one spot on the beach can be any better than another 200 metres away but apparently it is. 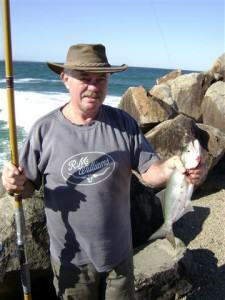 We walked along the sand for quite a way while John chose his spot and having decided that that was where he would throw in a line, we returned to camp for the fishing rods and bait. I picked up a magazine at the kiosk and we set off after lunch for what John hoped would be a productive afternoon on the sand. Well. I settled in with my magazine and John went off to cast his line and it was barely a few minutes before he was struggling with something that he’d hooked. didn’t want to go. His tail, with barb on the end of it, was swinging around wildly so no one could get close to him. Finally, using a piece of driftwood, John and a couple of the spectators managed to push him down the sand far enough that the next wave picked him up and away he went. He was so beautiful; it would have been terrible if he’d died on the beach. And that was more than enough excitement for one afternoon, thank you very much! Things settled down after that and John cast his line out again but in the 2 hours we were there all he managed to catch were a couple of little darts that simply weren’t worth keeping. Feeling a little dejected he gave up and we returned to the park where we made good use of the pool for the rest of the afternoon. pay attention to him! I drove down to the breakwater to pick John up later in the day and arrived just as he was landing a fair-sized tailor. It was a nice fish that graced our dinner table that night but he did tell me about the ones that got away and how they were so big they would have fed a family of four for a week! Right. We left the next morning feeling refreshed after our break and we know it won’t be all that long before we’re back. There is a whole range of accommodation in North Haven if camping or caravanning is not to your taste but whatever you choose, this town is definitely well worth a visit. North Haven is one of the most picturesque towns in the Camden Haven region and the perfect place for a relaxing weekend away. Only 4 hours north of Sydney, it’s easy to get to but so hard to leave.